More like note, comments and suggestions. RateBeer does a fantastic job, and has an annual rating of beers based on readersopinion, sorted by category. I thought two things about this article, maybe three. The first is it's a great reference to have, and any zythologist worth his or her salt should make a point (as I am going to do) to try each of the beers you've never had. This should include ones you don't like, as far as style goes, although personally I'm not keen on ciders and perrys and I will pass on these. Should also add parenthetically I've had some vintage ciders in England, long before ciders became popular in the states, and I'll guarantee you some of the stuff over there blows the snots out of some of the stuff listed below. Also sad to see nothing from Urban Farm Fermentory (or UFF) as their stuff is amazing; and that's coming from a non-cider drinker. The second and third items somewhat go together. Some of these breweries are insanely popular, and with such limited release there can't be more than a handful - metaphorically speaking - of RateBeer members who have tried the beer. This also means that while people may be focusing on these beers, they could be missing literally dozens of others, as good or possibly better. Below, I have tried to break down each section, note the beers I've tried, and any comments, observations, or witticisms. I do apologize in advance as some of the beers I recommend may not be available, or even out of production. It's also possible a brewery is out of business, but I doubt that. I will promise that you should like any of the ones I recommend, assuming you like that particular style. And as hinted at earlier, if you don't like a style, it's worth opening up your horizons. I remember in college, a lifetime ago, late last millennium, a really good friend of mine had me try a Pilsner Urquell for the first time. As this actually had an aroma and the flavor, I was taken somewhat aback. Many years later, early April 1997, I started tracking my beers, starting with a database on an Apple Newton, then migrating to FileMaker on a Palm and then to an iPhone. Now I stand at 5,969 different beers, and plan to hit 6,000 in Salt Lake City UT in May of this year. I shall also apologize in advance if any of the styles appear to be in error. I do write down a beer style and base that either on the label, what the bar/brewery/brewpub says, what the Internet says, or lastly a personal opinion if I have to guess. And the numbers to the left are the rating in that particular category. I mostly commented on only those I have had. So far. 8.0 (on tap in Liverpool UK), and 10.0 from a bottle. 9.5 out of 10.0; really nice grapefruit pine mix. This was an 8.5; and at $12 a bottle it had better have been a 7.5 or higher! 8.0; thought it had a rather chewy barleywine mouthfeel. 7.5 out of 10.0, in Germany. Also a solid 7.5 out of 10 - most beers I rate over 7 will always please. Wow, tried a lot in that category. Some others I have tried, and liked, are below. Have not had any I am proud of; most are not that good. I did try to couple when my older son's friends had me play "Edward 40 hands." A 10.0; Montmorency cherries; 1 pound per bottle. altho I believe brewed in Belgium? their Rapture Heather Ale; it's good. If you want to try some good ones, in my opinion, in these categories, take a look at these. Heather was used as a bittering agent in Scotland, until England forced them to use (i.e. purchase) hops; this took place as part of the brutal "cleansing of the clans." cask bitter can be much better than this. (heaven & hell) that you can age for 25 years. Some good examples of the following styles. Nope, but their Grand Cru 2013 was smashing. May 2 at Armsby Abbey (as I said, try ones you haven't) - a 9.3. A 9.0 for on tap. Varies a bit between fresh at brewery (10.0), to cask (9.9) to tap (9.0). A consistent 7.5 tap, bottle or at the brewery. Any of these IPAs below will satisfy you. Hmmm, thought I had this, as I had been to the brewery. 10.0 if you drink it from the can; else 9.5. 9.0 at the brewery, where all on tap were tried, 5-26-2011. This is 9.2 (tap) and 9.5 (can). Note I would categorize a Gose as a sour beer; or frankly a variant as its own; I mean it's not a lager, nor an ale. Plus I noted that some of these, such as "New Glarus - Belgian Red" are repeated here. Thought this was a 7.3; not bad but in category of lower ABV, it stands out more? as the second anniversary of a really good local bar we like. A 10.5 out of 10.0; yes, a 10.5 like the open-ended Richter scale. Now about some really good beers under 4.6% ABV; I assume shooting for 4.5% or lower, which is a "Session beer" by some definitions. And as with RateBeer, some are repeats. So you don't need lots o' ethanol to have a great beer. Also many of these are UK beers, as sadly, their archaic tax system charges more per % alcohol! Madness. A 10.0; much better than Brunch Weasel. Also a nice 8.5 of 10.0; at the brewery. This was rated a 6.5 for a tap pour; that's not a bad beer but not spectacular. Any of the stoutish varinats below will please. This was a handy 9.5, and at 14% it should age well. We rated this a 7.5 at the brewery in 2011. You could do worse to try these here. I have to add that barley wines (or barleywines) are a favorite. I could put a lot more than those below. Also an important comment: a barley wine is one of the most perfect beers to age. If you like the style, purchase 2, 3, 4 or more, and store them in a cool area. Try one each year, or every couple of years. The change is not subtle, and usually improves every year. I have several bottles from different breweries back to 2009. Only garnered an 8.0 but that was the 2010 version. Is it a barley wine? Also given as a gift, so thank you, Roger. Thought this was more of a 7.5 at the brewery in 2012. Interesting story about the Smuttynose wheat wine. We were at the brewery getting a tour, when they released it. It was delayed because the bottle had the word "wheat wine" as two words; the BATF (in their infinite wisdom) thought it was a wine, and it took some extra paperwork delays before releasing it! I gave this only a 7.5, but that was years ago, probably before 2000, as that was before when (oddly enough) I began to track the date. I do plan to try it again, but that is not a bad score. Also decidedly odd in that so my favorite styles of beer are porters and was surprise that I only had one, of all beers in this RateBeer list. 8.5 from tap; 8.0 bottle. I've had a Dragon's Breath, but no Puppy's Breath. 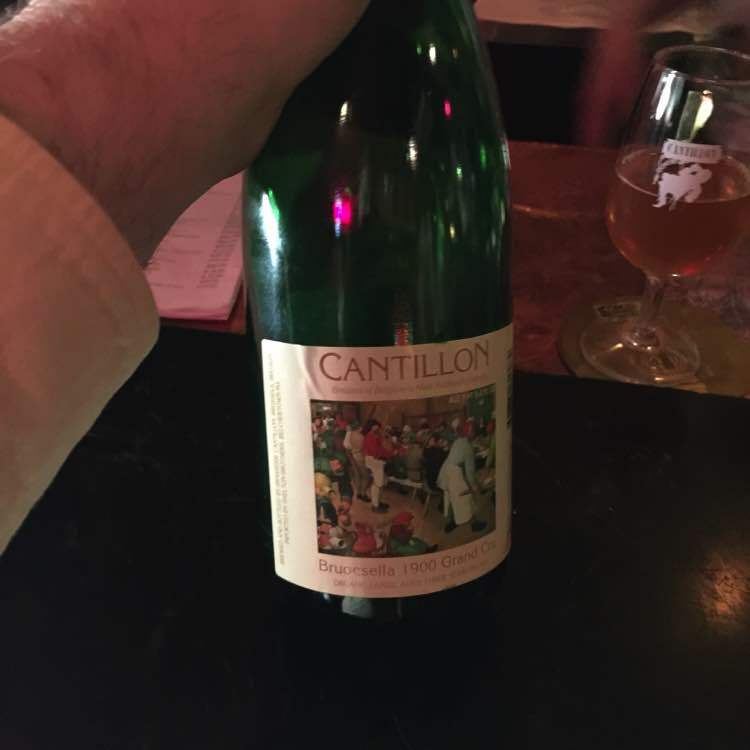 Before we get into this, here's some comments and a personal observation about Cantillon. I think it's really good product. However before it became very popular, I thought a lot of the beers were solid say 8.0 or higher. Not the insane eyes-rolling-back-in-your-head, must have at any price, flavor. 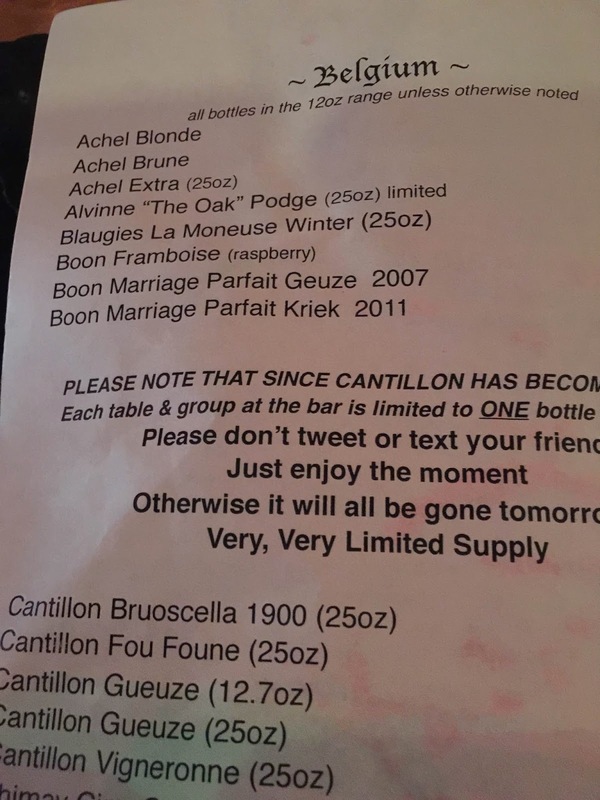 I do know Cantillon is expanding, which is great, but I also hope it doesn't affect the quality. I am reminded of a Belgian Trappistbeer producer, that when they were given the appellation "best beer in the world" they ramped up production to meet the crazy demand. With a slight, but still discernible, negative effect on their overall flavor. 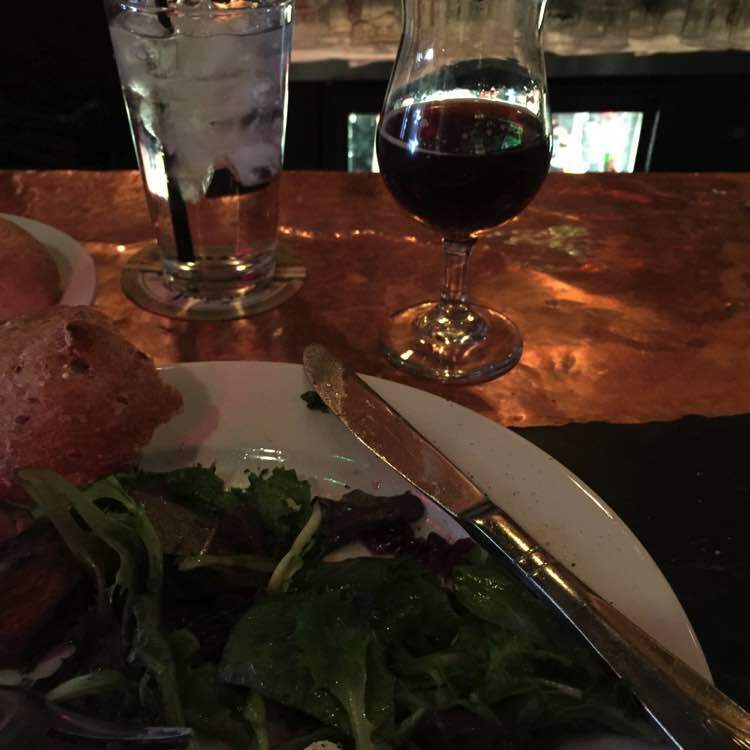 This was an 8.5 in 2011, at Monks in Philly. A 9.5 at the brewery. This was a 9.5 at Moerder Lambic 2014. Try any of the following. Note that for some, a beer with a sour flavor is best served with a dish like roast chicken or turkey. Or strong cheese. Weisse "mit schusse" (with juice). Good luck finding a Faro, it's a very uncommon style. This is a sour rauchbier, and is quite amazing with the right food. Considering that Belgian beers are our favorite... was surprised had not had many of these. Although I personally make the distinction between say "Belgian" and "Belgian style." Any of these are good. The only precaution is know your source/store. Most beers are adversely affected by poor transport/storage conditions. 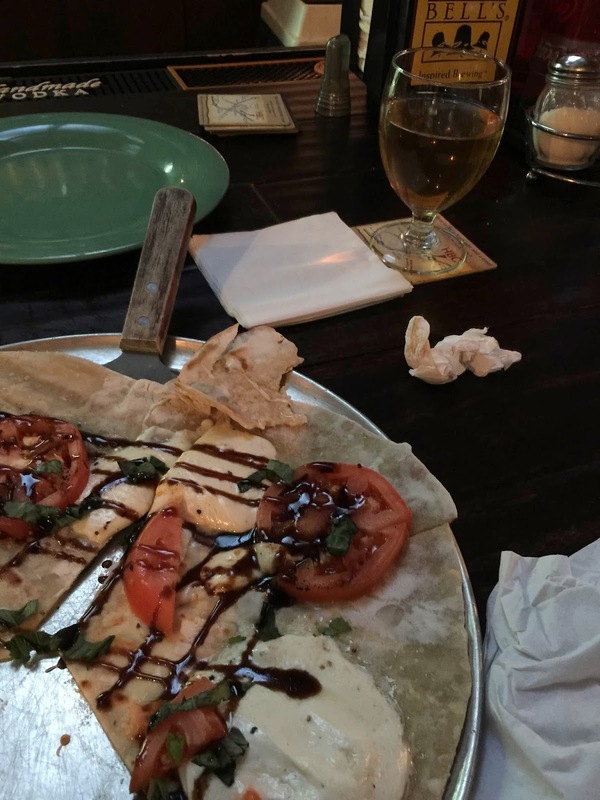 An 11.0 out of 10.0; at the brewery; eating the monk's bread; and cheese also. And a vintage 2001 bottle was a solid 10.5 (in 2011). A 9.0 in the bottle. If you mean Pannepot Old Fisherman's Ale, then 7.5 (2010 vintage in 2010). eating the monk's bread; and cheese. 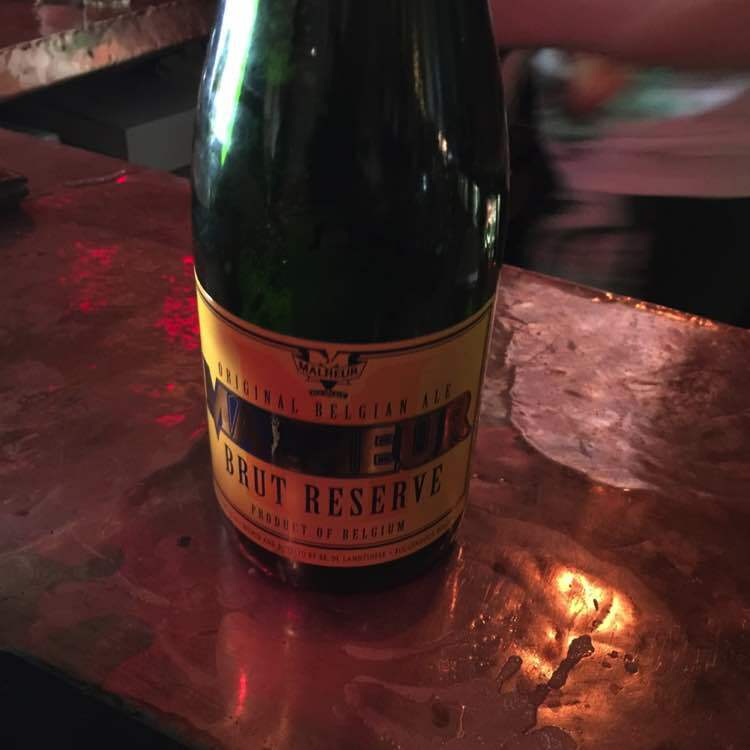 A solid 8.0, and at the Kulminator in Antwerp we were able to try a 2001 in 2011. Surprised to see of the 4 beers I've had with "Nelson" in the name, this was not one of them. 1999 in 2014 was a 7.0 but quite drinkable. A consistent 8.5; harder to find on tap in Belgium VS USA. Did not have the oak-aged version, but this was a 9.5 in Geel. All of the brews noted below you will find quite enjoyable, some are limited release and/or limited availability so I can't guarantee you'll find it. Another category that I had not had many of the beers in although I am pleased to see that my scoring personal scoring dropped fairly linearly from number 1 (at 10.0) down to number 11 (at 7.0). Only had the Autumn at 9.5; wish it didn't cost so dearly in CT. This was a good 7.0 hefe. 7.5 at the brewery, 8.0 from a bottle. An 8.5 at the Beer Temple, Amsterdam. Get out whenever, and find one of these. This was an 8.0; tried it befor I was tracking dates. Nope, did try one with the same name from a brewpub in Berlin - Lindenbräu. Try any of these below. Nope. I mean I have had some and liked most; just didn't track them. A 5.5 and strong at 9.00 ABV. Unusual styles to be sure, but those below are a good bet. Sadly, made it to Germany in 2014, but not to Leipzig, home of the Gose style. Also try these other styles or variants of beer, that did not make the RateBeer list. I mean you could call this "spice" or "herb" but it's name is gruit or gruut. So what's next on your list? Had a nice trip, or actually two trips in March, back-to-back. The first one was to Philadelphia PA, to give a talk at a company I used to work for; and later in the week down to Charlotte, North NC. 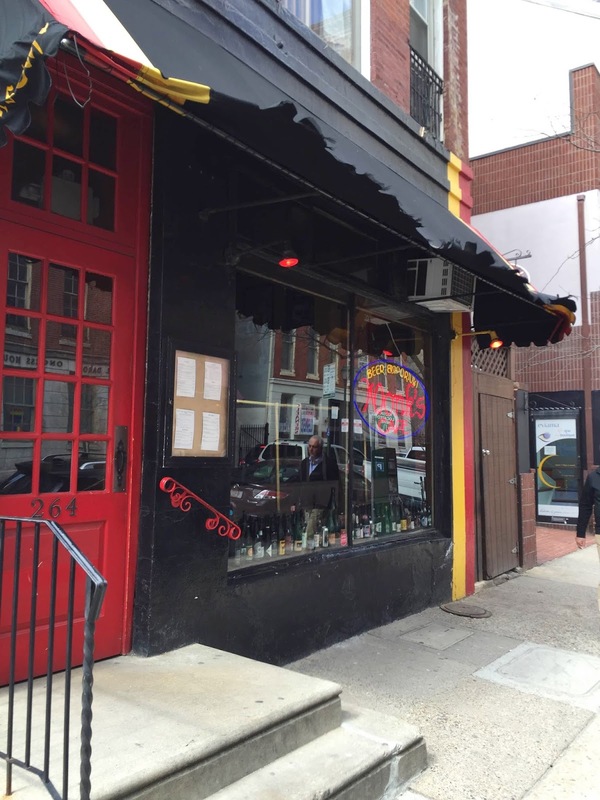 Since I arrived at noon at the Philly airport the day before my talk, what else was there do but take a taxi downtown, to the incomparable Monk's Café. 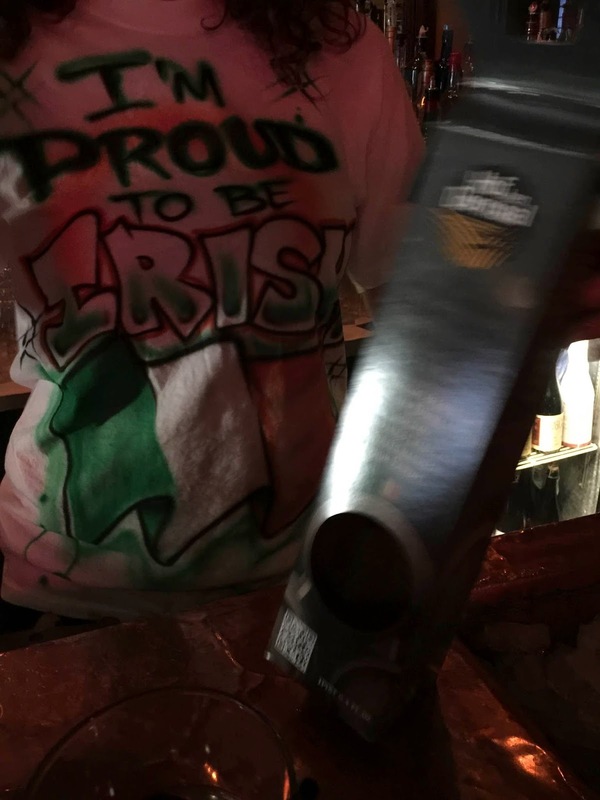 As luck would have it, it was St. Patrick's Day, and Philadelphia does have a rich Irish heritage. Although, truth be told, my plan was to mostly drink Belgian beers because that is one of the many things Monk's is famous for. It is also famous for good food and friendly people and great service etc. but I was there for the Belgian beer. When I first arrived, it was not very busy, which is always good; and was able to get a prime seat at the 1st floor bar. Also by some strange happenstance, I actually had nothing green on, not even my socks or underwear. The friendly hostess at Monk's offered me a giant Cat-in-the-Hat-style green and white striped chapeau, to which I politely refused. And even though I wanted Belgian beer, I first started with this. Chatted with several people about beer and Monk's, and the weather, it was really having a great time. About that moment a large group of folks came in wearing, of course, green shirts and some green hats. These folks were happy and drinking and having a great time; what was kind of scary and someone else commented later; this was their first stop of 18 today; and a few them were already quite intoxicated. Good luck and God bless reaching pub number 18. Ironically, the next beer was not Belgian either. Ordered some food, a nice steak salad; I do this point regret not ordering the classic steamed mussels at Monk's, which are superlative. Settled down into a routine of several Belgian beers after this. 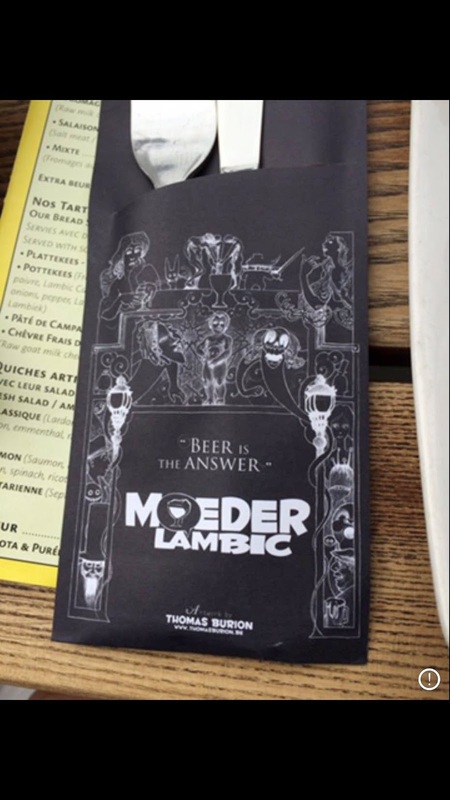 Since they had a brochure for Moeder Lambic, I told the bartender and several people the story about how last year we were on vacation in Brussels, and drank there, and stayed at the Metropole Hotel. It was only a month or so ago we found out that in one of my uncle's letters from WWII, he also stayed at the same hotel as we did; although separated by several decades! What's interesting is in reviewing my notes, I realized I had beer #400 here a few years before with some friends, in 2007. What was even more interesting is the same beer is still available. And what was slightly shocking (but not surprising) is the same beer that was $25 back then, was now $50. 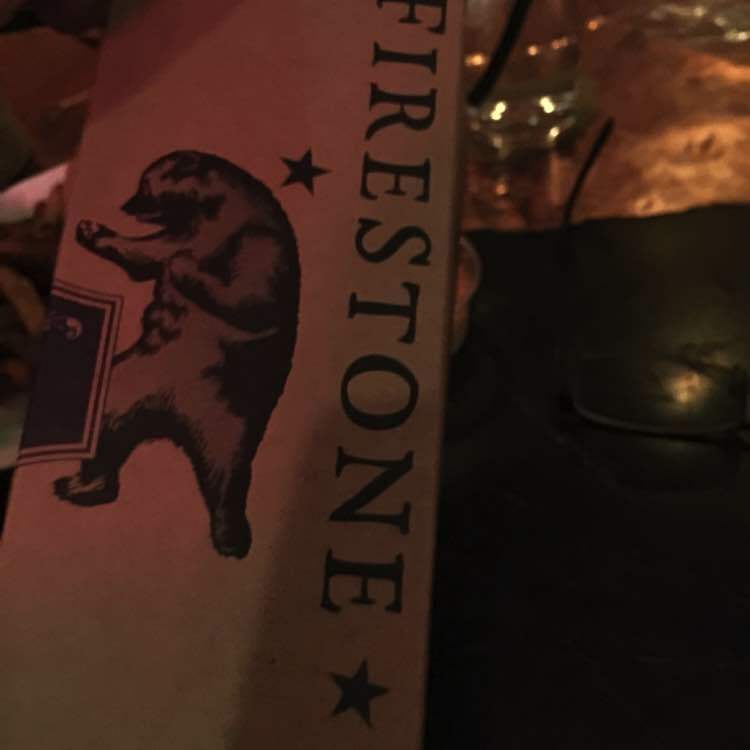 I did share with several people in the bar, as is our custom. Then in looking at my notes, I asked the bartender if her name was "X" (that is not her name I am just not putting it here). It was and she was the same person who served me and some friends, way back in 2007. What a rush, as was the beer; this was #5,879 by-the-way. What I love about having a large bottle - or three - is sharing. 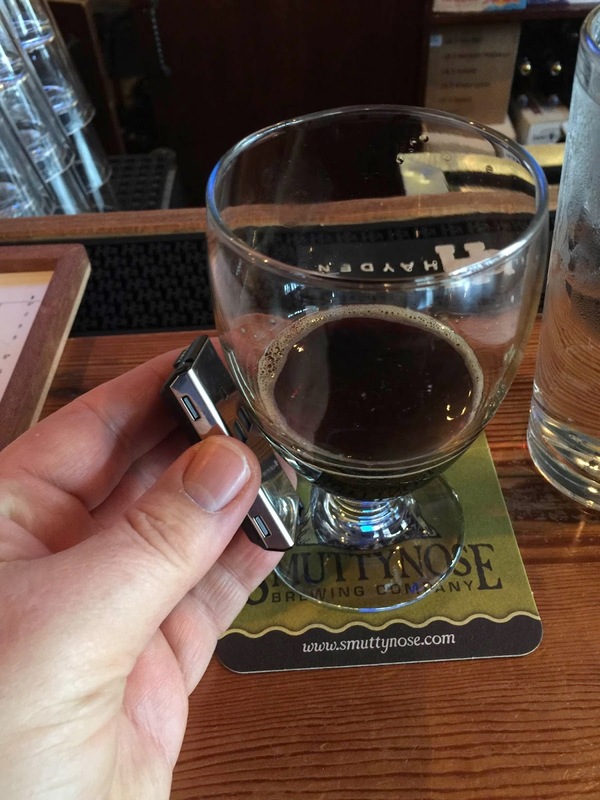 You can share with other people around you, share with the bartender to try it (if allowed). 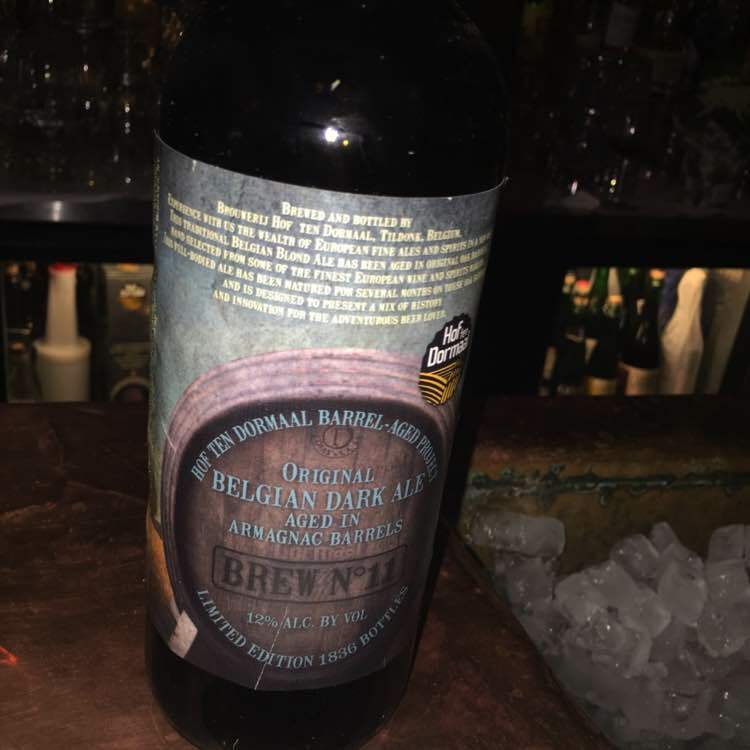 One of the patrons shared theirs with me; he was more of a stronger porter/stout fan, and I think it was actually quite good; and even better, it was Belgian. I decided, even though we have several bottles at home, I did not have this particular Cantillon beer. Extremely good, and much like the open-ended Richter scale, sometimes there's a beer that I rate above 10 on my 1 - 10 personal scale. Also note that recently I change my scale, so instead of using just 0.5, the increments are 0.1 for better resolution. Nothing anyone cares but that's why the score is 10.2 as opposed to 10.5! Had a couple more Belgian beers, actually another one rated above 10. Parenthetically I should add if you have never had Armagnac, it's worth trying. It's a variant of cognac not made in the Cognac region of France, and it has some slight differences in flavor. On our bartenders advice, she suggested the final beer not Belgian, but quite good and I agree it was. The next morning, got to chat with some people I hadn't seen in 15 years or more, and had a successful meeting. A few days later, headed down to Charlotte to give a similar lecture; hence the title of this particular chapter: Monks and Panthers as in Monk's Café and the Carolina Panthers. As I got in early, tried a few local beers, nothing too fancy as this was the Hilton after all. 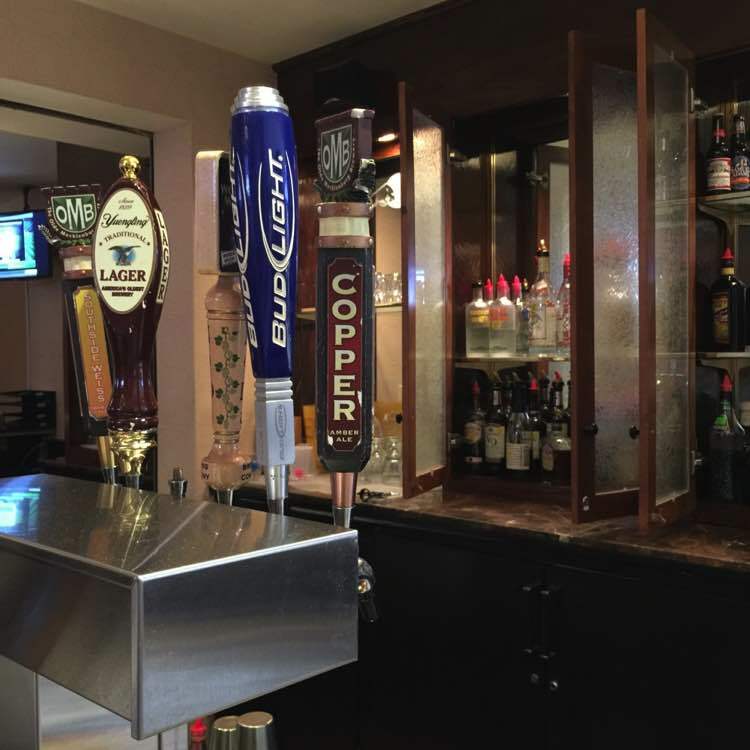 Sadly in most chain hotels, as nice as they are, they have a beer selections that is nothing to write home about. Based on my reconnaissance, (and trust me, if Rommel planned as well as I did, well, you get the picture) I had several places in mind to get to. 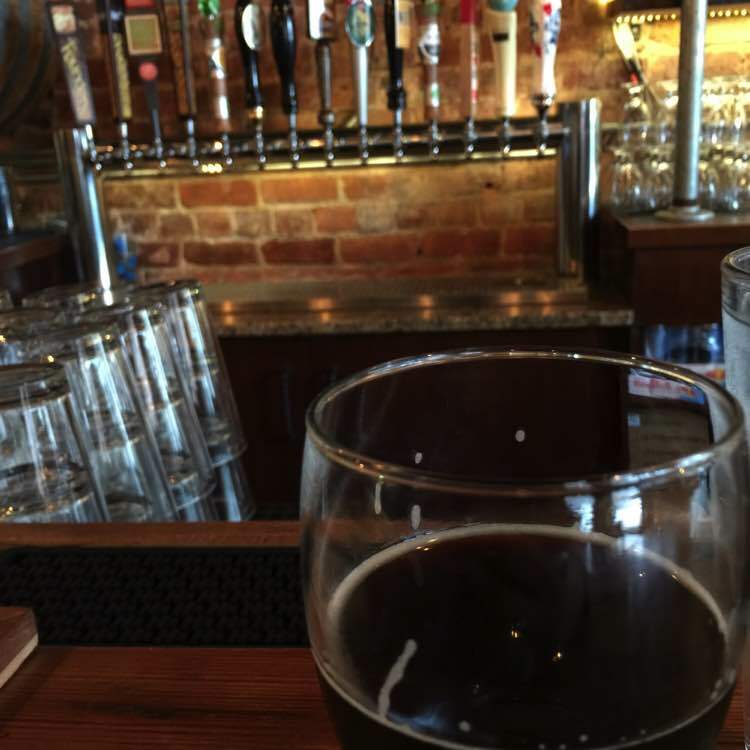 A quick taxi ride took me to Growlers Pour House. 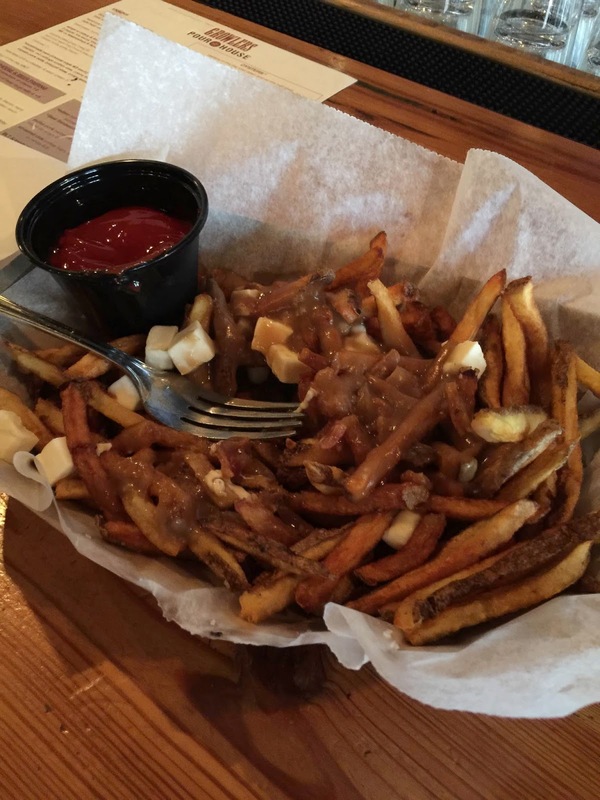 For a snack/lunch I had their version of Poutine, which was delicious. And possibly as far South as you'll get it. They had a very nice selection of local beers as well as regional; Also it was interesting to see how this state's laws allow growers to be filled in a bar. And yes, I was taking the temperature of some beers, because I do get obsessed sometimes. 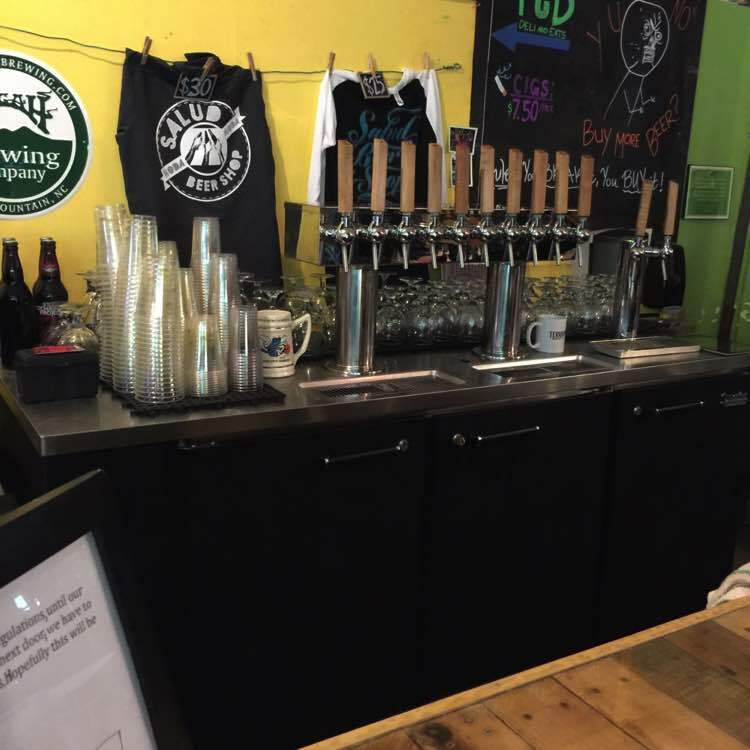 I did leave Growlers planning to go to Salud, which is a short walk away. 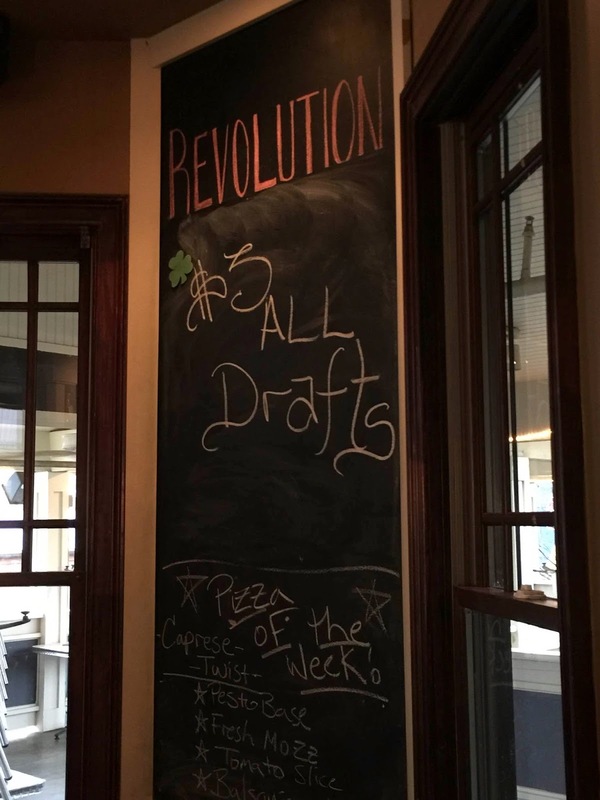 I did not realize that in between the two was Revolution Alehouse. Tried the following two beers, the Gose was actually quite good; a slight saltiness without being forced. For dinner had their capresé salad pizza with balsamic vinegar, which was recommended by Jerimiah, and was delicious without being too heavy. 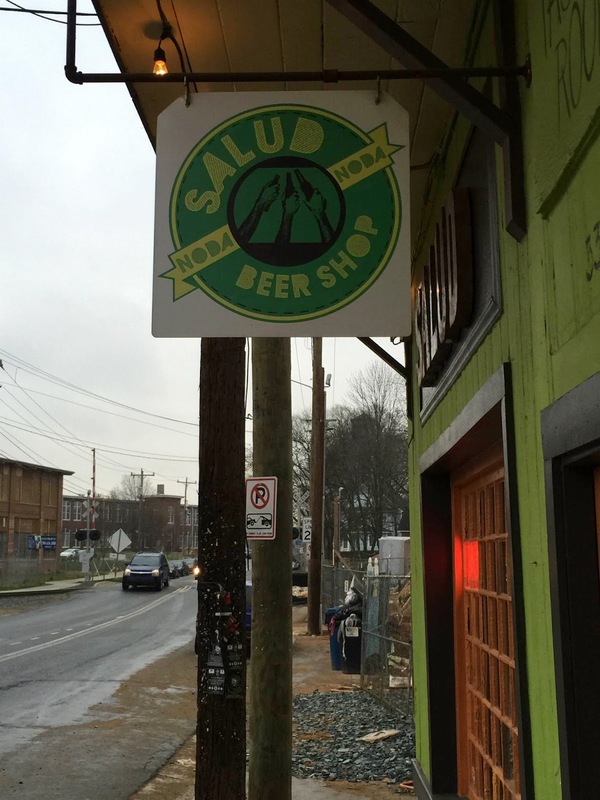 Headed over to the Salud beer shop, where you can buy to go, as well as drink beer there. They're planning on having a kitchen soon, so if you live in the area, check them out in the next few months. 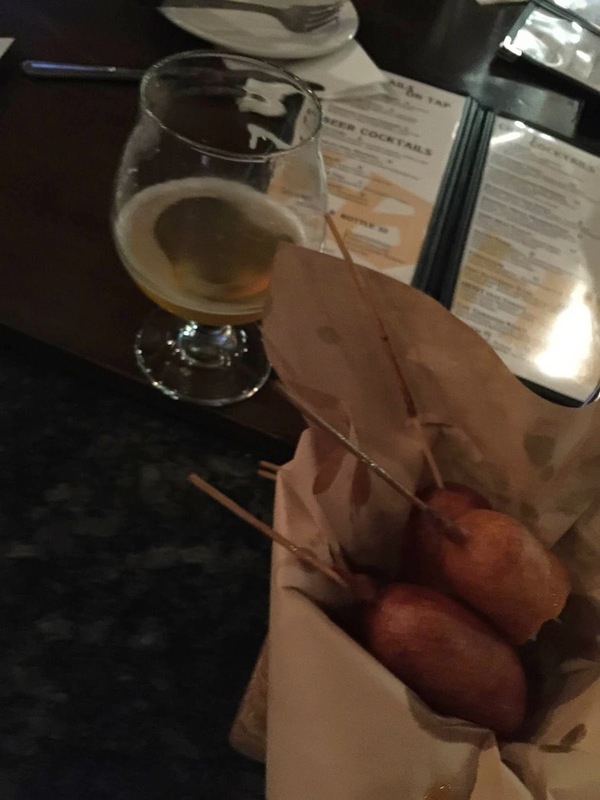 Started out with a personal favorite from an Asheville NC brewpub - Wicked Weed. Then several of these other beers. Bruery Seven Swans a Swimming 7 Ale, Belgian Quadrupel 11% [7.3] boozy! 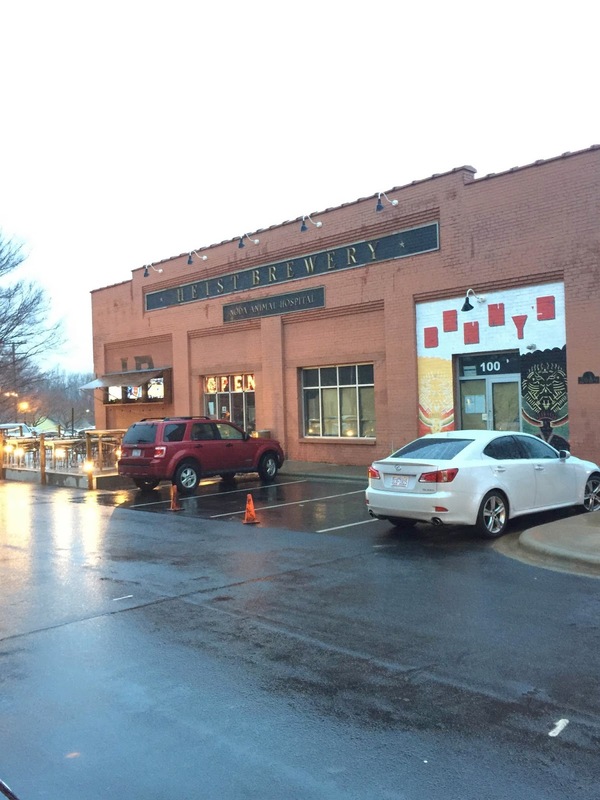 The last place to walk down to was the Heist brewery. As it was getting late, and I had to talk the next morning, did not have too many here, only one. I'll be back some other time, and they're not leaving anytime. ...on the advice of a local enthusiastic patron - it was fantastic. Should have, but couldn't stay longer. As a postscript I discovered the world of Uber. When I asked if the hostess if she could call cab, she asked if I've heard of Uber. I said yes, but I didn't have an account; she quickly should me how to sign up, and within 4 minutes I was heading back to hotel. And as it was my first Uber ride, It was free! So go to see some old friends, drum up new business, and drink several good beer at some spectacular places.